Charlie Taylor will be looking to take advantage of Burnley’s form at Turf Moor when the Saints come marching in to town. The Clarets have taken 51 points at home over the last two seasons and have beaten Southampton by a solitary goal in both previous outings against Southampton in the Premier League. On the other hand Mauricio Pellegrino’s men have only won twice in 12 games on the road this term, though they were successful on their last trip when seeing off West Brom at the Hawthorns. 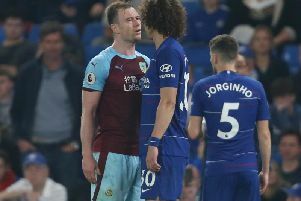 Burnley haven’t won in 10 games in the top flight, 11 in total when considering the club’s FA Cup exit to Manchester City, but Taylor is in confident mood ahead of the weekend. The summer signing from Leeds United, said: “We’ll be doing all we can to put an end to the run. “We’ve got to take advantage of that. We’re strong at home and hopefully the wins will come. The 24-year-old now faces stiff competition to keep his shirt following Stephen Ward’s return to the squad. The Republic of Ireland international was named on the bench against Swansea City at the Liberty Stadium. “Wardy is back now, he’s a fantastic left-back,” said Taylor. “It’s great, you want the competition, you thrive off it. “Without any competition you could take your foot off the gas, so it’s good for both of us. The competition is good and we’ve got it all over the pitch really. “Before Wardy got injured he was playing really well. I had to wait for my chance.